Have you found the prettiest crochet blanket pattern you've ever seen, but discovered that you want it to be a different size? This crochet tutorial How to Crochet: Re-Sizing Crochet Blanket Patterns will show you how to make your special afghan the right size for your needs. There are a few ways you can re-size an afghan. You can change the weight of the yarn, change the size of the hook, or adjust the number of repeats in the pattern. The size of your crochet blanket pattern often depends on your purpose for that crochet afghan. There are crochet baby blankets, throw patterns, lapghans, and even afghans to cover beds that range from cradles to king size. Need more help? Check out: Yarn 101: Yarn Weight, Type, and Which is Best for Your Pattern! The main rule of thumb with this kind of re-sizing when you're figuring out how to crochet your new crochet blanket pattern is the smaller the gauge of yarn, the smaller the size afghan. Conversely, the bigger the gauge of yarn, the bigger the size of the blanket. For smaller crochet blanket patterns, choose DK yarn and for much larger patterns, use chunky or even super chunky. Just like changing the weight of the yarn, a smaller hook will make the stitches tighter and, therefore, make a smaller sized afghan. When you're deciding how to crochet the pattern, you can make it larger and airier by choosing a bigger hook size. Hook sizes D and E are popular for making crochet blanket patterns smaller and hook size P works better if you want a large afghan that works up fast. Work a gauge swatch to determine how many stitches per inch you achieve with the yarn/hook/stitch pattern combo you are working with. If you need a bigger afghan, add more repeats based on the number inches you want to increase to. To go smaller, take away whole repeats based on the inches you’d like to reduce by. Still confused about hooks? 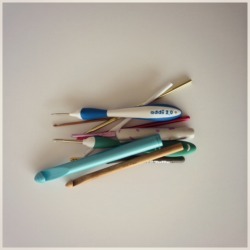 Read our Beginner's Guide to Crochet Hook Sizes and Styles! If you're asking, "How big is a standard baby blanket?" then you're in the right place. 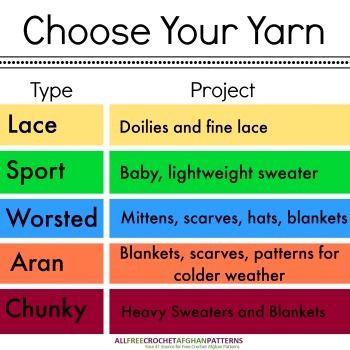 With this handy chart, you'll learn how to crochet each type of afghan size. You'll never have to wonder again! You can make regular throws any size you like or even make the width and height the same to make them square as the chart below only shows rectangular sizes.